The Freedom From Religion Foundation has harmonized an Arkansas high school’s choral area. Last fall, it was brought to FFRF’s attention that Searcy High School’s choral director had placed several Christian-themed posters on the walls of the high school chorus room. 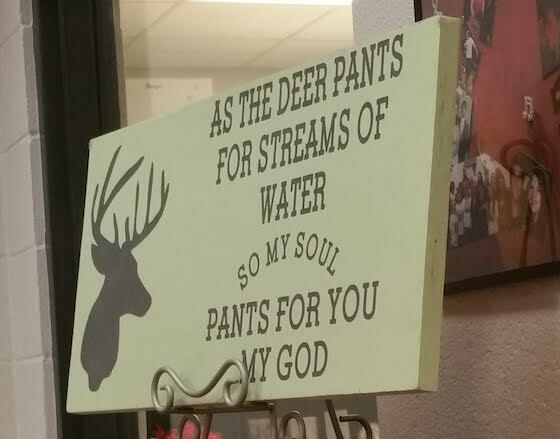 Most contained bible verses, including: Ephesians 5:19 (“Sing and make music from your heart to the Lord”); Colossians 3:14 (“Love binds us together in perfect harmony”); and Psalms 42:1 (“As the deer pants for streams of water, so my soul pants for you, my God”). Another poster displayed lyrics from the gospel song “Take My Hand, Precious Lord” (“Precious Lord take my hand, lead me on, let me stand”). In a letter sent to Searcy School District Superintendent Diane Barrett, FFRF warned the district that it violated the U.S. Constitution by allowing a display of religious symbols or messages. Courts have continually held that school districts may not display religious messages or iconography in public schools. Religion is a divisive force in public schools, FFRF noted, and the Christian display was particularly inappropriate, given that about 44 percent of those born after 1990 are non-Christian. FFRF highlighted that such displays alienate those nonreligious students, families, teachers and members of the public whose religious beliefs are inconsistent with the message being promoted by the school. FFRF was recently informed in a letter from Barrett that the Christian posters had been removed and that school staff had been informed on the unconstitutionality of religious displays. The Freedom From Religion Foundation is a national nonprofit organization with over 32,000 members across the country, including many in Arkansas. FFRF’s purposes are to protect the constitutional principle of separation between state and church, and to educate the public on matters relating to nontheism.